On the main page of the 99pledges site there is a box that says "search for participant." Individual donation pages for each player can be found by typing a player's name into that box. Donations/pledges can be made directly on the main page through the link above or through each player's individual page. Also, under each player's name is a "help spread the word" link that can copied and pasted into emails to send to freiends/family, or to post on Facebook pages, etc. Please view the Hit-A-Thon Packet for more information. The 2018 post-season has officially ended as the Patriot American All-Star team fell short of victories during the Junior Southern California Division III Tournament in Thousand Oaks, CA. However, it was not before the team displayed much grit and strong determination during two, hard-fought and exciting games against some tough opponents. The Patriot American team may have not won on the field these last two games, but they definitely succeeded in stealing our hearts during the tournament! The first game on Sunday, July 15th was against East Fullerton and was played on the beautiful George "Sparky" Anderson Field at Cal Lutheran University. It was an awesome and unique experience for the team to play in this large stadium setting - as for their fans, it was an equally awesome and unique experience. The score volleyed back and forth and was tied 6-6 in the 4th inning. It remained that way until the bottom of the 12th inning at which time East Fullerton scored a heart-wrenching run and took the victory. The team battled throughout the game and it was a tough loss, but in true Patriot League fashion, they respectfully accepted their fate of falling into the "Loser's Bracket," and bounced back quickly from the loss by going into the next game with positive attitudes. The second game was played against Lemon Grove at Conejo Creek Ballpark on Thursday, July 19th. This game appeared to be slipping away quickly from the Patriots as Lemon Grove took an early lead. By the end of the 4th inning, Lemon Grove held an 8-4 lead over the Patriots. However, the Patriots once again displayed their "never give up" spirit and started chipping away at the score by adding three runs in the bottom of the 6th. Then, in the bottom of the 7th with two outs, the Patriots excitedly pushed across the tying run taking another game into extra innings. The game remained that way until the top of the 9th inning when Lemon Grove scored a run. 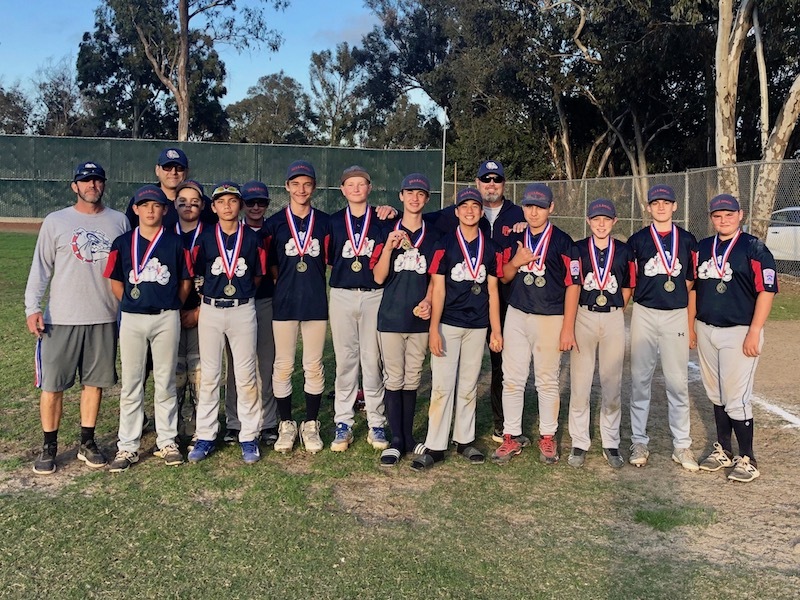 The Patriots were unable to score in the bottom of the inning, so the 9- 8 victory went to Lemon Grove and eliminated the Patriot American team from the tournament. Another congratulations goes to the team for being the D33 and Section 6 Champions, and for being such fine representatives for the Patriot League during the Southern California Division III Tournament. The team was not only respectful of all their opponents, but they also earned their respect in return. Each player displayed quality sportsmanship, worked hard, and was supportive of one another from the very beginning. The bond the players created between each other as individuals and as a team was special, and the memories they created throughout this entire experience will last them a lifetime. It was an amazing journey for the players, manager, coaches, parents, and all the fans who supported them along the way. As a league, we are all exceptionally proud of the Patriot American team for their accomplishments, and for taking us along on this wonderful journey! 2018 California Section 6 All-Star Champions! CONGRATULATIONS to the Patriot American Junior All-Star team for winning the Section 6 Junior Division All Star Tournament. They beat Rancho Buena Vista (5-3) and Encinitas (5-4) to advance to the championship game where they played Encinitas again for the title. In the end, the Patriots outscored Encinitas 9-8 to claim the title. The Patriots will now advance to the 2018 Junior Southern California Division III Tournament in Thousand Oaks, CA. Their first game is on Sunday, July 15th at 3:00 p.m. at California Lutheran University, Sparky Anderson Field at Ulmann Stadium. For a complete schedule and field addresses, please click here. Also, KUSI covered the championship game. Click here to view the news clip and game highlights. Congratulations to the Patriot American All-Stars lead by manager Tyler Hemmings on winning the 2018 District 33 All-Star Tournament. 2018 Patriot League TOC tournament. Patriot Baseball is a chartered Little League for players league age 13 through 16. 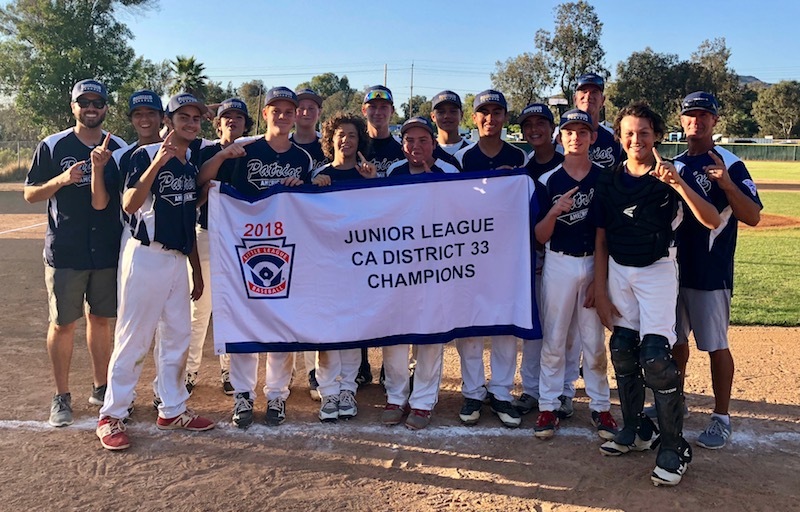 Players "graduating" from Allied Gardens, San Carlos, Mission Trails, Lake Murray, Rolando and La Mesa National Little Leagues are eligible to play in our league without a waiver. We play two seasons: the Spring Season is from February through June and the Fall Season is from September to November. We are dedicated to providing a place for kids to learn to play baseball in a fun, safe and encouraging environment while promotion good sportsmanship, honesty, loyalty, courage and respect for authority. The Patriot league is operated entirely by volunteers without financial support from the city of San Diego. If you are interested in contributing your time and effort to benefit the kids and our community please contact patriotleaguebaseball@gmail.com. Our mailing address is: Patriot League Baseball, 7936 June Lake Dr., SD, 92119. 100% of the proceeds goes to league operations. Donate Today and help us provide a high quality baseball experience.